← Will there ever be Norway Havaianas? In the on-going series “We Love Carbs”, I have checked out yet another bakery, this one located in Palermo Soho. 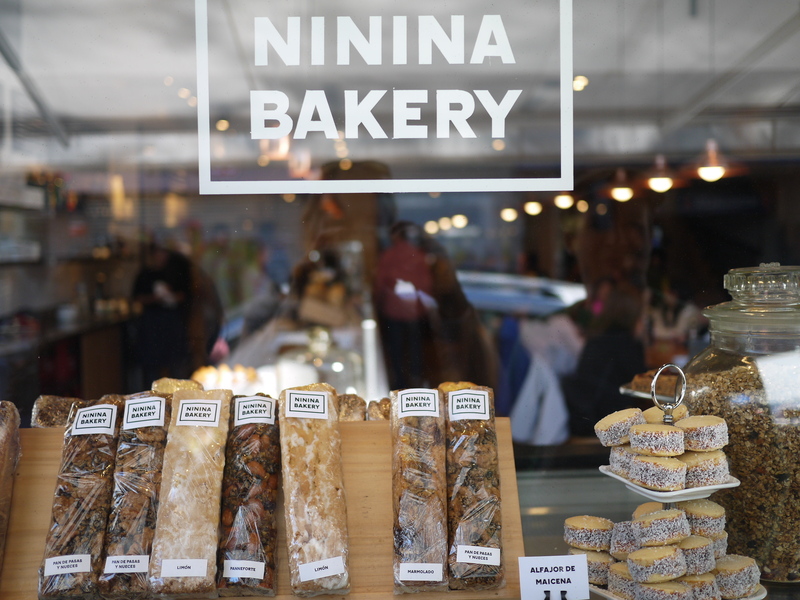 Ninina Bakery opened earlier this year and is a delicious addition to the neighborhood, with all sorts of baked goods, pastries, sandwiches, salads and smoothies. We went for Sunday lunch with Norwegian-Argentine friends and while there was a wait (20 minutes or so) it was definitely worth it. The place is huge so things were moving pretty fast. We had the choice between outside and inside and decided to sit inside; it was warm but not that warm. I loved the open, airy space, you can see the kitchen further in and they even have a private dining room with view of the kitchen. 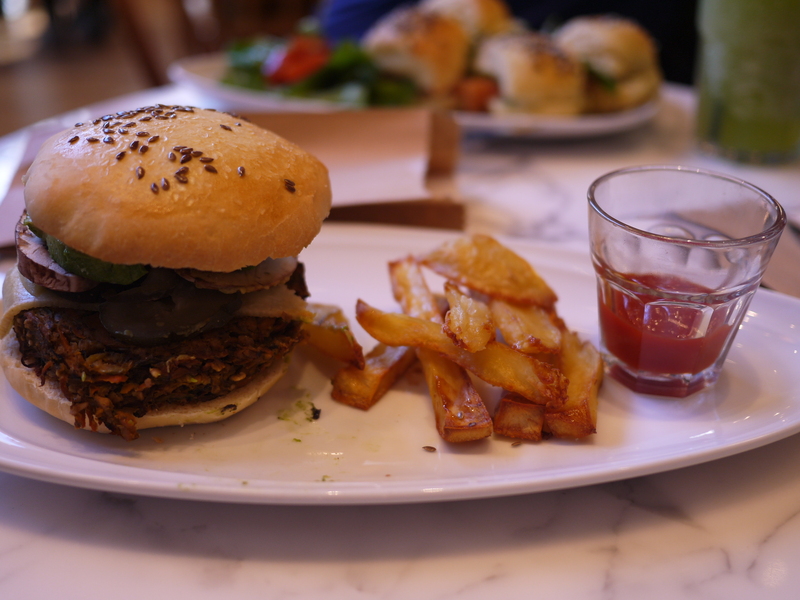 For our lunches, I had the veggie burger (really good – great toppings, great fries, my only complaint would be that I would have liked more fries) and my friends had the prosciuttto and burata salad and the salmon sandwiches. Everything was delicious! One of my friends also had the raspberry and avocado smoothie and it was fantastic! For dessert we shared a piece of cake, I think it was called Perdición and it was so good – it had merengue, chocolate mousse, cream, and strawberries. 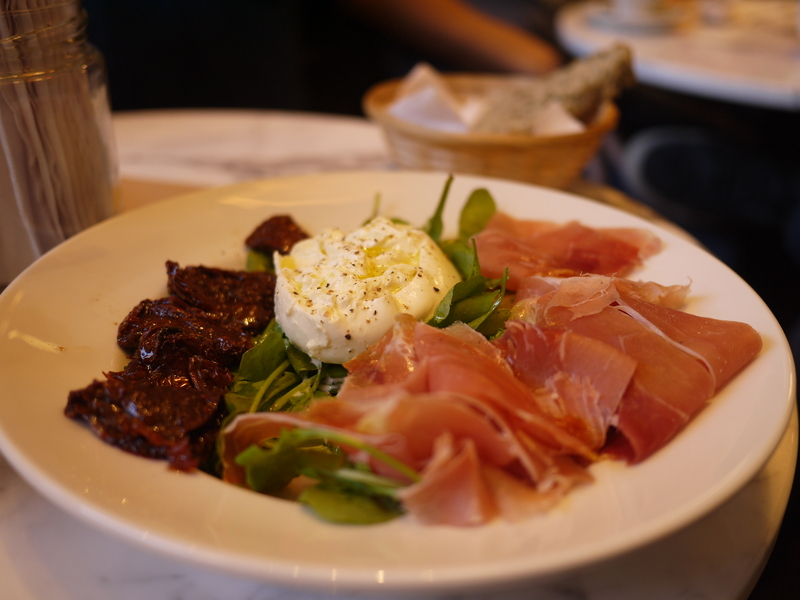 The service was good to begin with but then sort of fizzled out – our waitress disappeared and it seemed nobody had been assigned to our table so we had to try to flag down other waiters to help us. However, this was a minor issue (I see quite a lot of bad reviews on their service but we were fine until the second half of our meal and by then we had almost everything we wanted.) Highly recommended!! This entry was posted in Buenos Aires, Restaurants, Veggies. Bookmark the permalink. Todo se ve muy rico pero los alfajores de maizena juro que me están llamando, jiji. Me tentaste, creo que con el dulce de leche que me queda voy a hacer algunos ;). Me imagino que guardas tu stock de dulce de leche con la vida jeje! Antes de venir a la Argentina solo conocía los alfajores tipo Havana, y no me gustaron mucho, pero los de maizena me encantan!